As the highly anticipated special election for Georgia’s 6th District came to a close, it became clear that Democrat Jon Ossoff would face Republican Karen Handel in a June runoff. Despite a strong showing, the millennial hopeful ultimately failed to secure the 50% of votes needed to win the seat formerly held by Newt Gingrich outright. Nevertheless, the Democratic establishment’s hopes were high given President Trump’s low approval ratings. 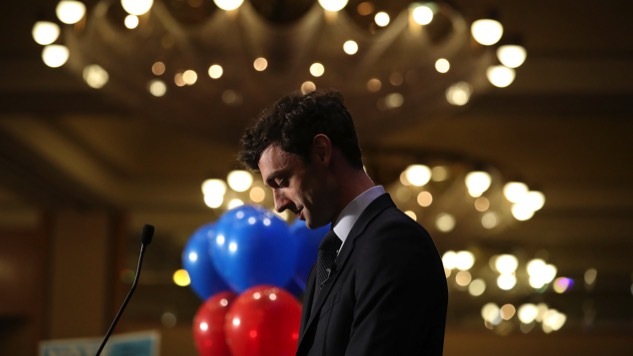 Ossoff, a handsome, young centrist, quickly became the darling of the Democratic establishment following Hillary Clinton’s devastating loss in November. Speaking in party-line platitudes and notably eschewing the kind of progressivism sweeping through the party’s base, the millennial upstart gave establishment Democrats hope for their future. Brian Fallon, Hillary Clinton’s former Press Secretary turned senior advisor to Priorities USA, a pro-Clinton super PAC during the 2016 election, even tweeted out that Ossoff was showing the Democrats the path to retaking the House, through the “Panera Breads.” In other words, the party should appeal to the comfortable upper middle class. But Tuesday night, those hopes were dashed and, with them, this strategy was, once again, exposed for the loser it is. Throughout her campaign, Handel repeatedly attacked Ossoff for his status quo centrism, tying Ossoff to House Minority Leader Nancy Pelosi, and painting him as a corporate Democrat, ensconced within the Hollywood (wealthy) liberal bubble. According to Handel, he was a phony, out of touch with the concerns and needs of the people within Georgia’s 6th District. “He talks like a Republican,” she once said, dismissing the millennial upstart with a familiar attack. Ossoff, who tried to cast himself as a pragmatist focused on deficit reduction and opposed to single-payer and tax increases (even for the wealthy), made the same blunder Democrats have been making for years: he surrendered the narrative. Anyone paying attention to politics over the last decade should have seen his loss coming a mile away. Around 2009, the Tea Party Movement was in its infancy. All around the country there was a groundswell of right wing activism, a backlash against the Obama presidency and the status quo of Washington politics. With the Census and redistricting occurring the next year, wealthy conservative donors and groups, like Karl Rove’s American Crossroads (and Crossroads GPS) and the Koch Brothers’ Americans For Prosperity, seized the opportunity, and poured money into organizing at the state and national level. The next year, it paid off. The revolution swept through the state legislatures as well as Congress, bringing with it a new class of right wing outsiders who ousted not only their moderate Republican predecessors in safe districts—much like Georgia’s 6th—but Democrats as well, who suddenly found themselves face-to-face with angry protesters at their town hall meetings. The ascension of the Tea Party, along with the 2010 Republican redistricting effort, pulled politics drastically to the right. The Democratic Party leadership saw the moment as an opportunity to pick up the alienated center. Needless to say, it wasn’t long before Democrats were acknowledging a non-existent debt crisis, pledging to cut wasteful spending, and stressing job creation through incentivizing investment (code for cutting ‘burdensome’ regulations and taxes). Although the 2012 presidential election saw a swing back to the left—largely thanks to the Occupy Wall Street Movement and its energy—Democrats didn’t catch on to what was happening and continued to govern as moderate Republicans. Ultimately, that decision did little to stop their hemorrhaging in the 2014 midterms as inequality continued to fester. In response, the GOP castigated their leadership as weak, unwilling to do what was necessary to ensure growth. At a certain level, Democrats could hardly disagree considering they were still arguing on the Republicans’ terms, essentially admitting that their opponents were right at a fundamental level. Meanwhile, populism continued to gain steam on both the left and the right. Years of neoliberal and neoconservative politicians treating imbalance of power and wealth as a natural consequence of progress came to a head in 2016. Democrats ran a D.C. insider, transactional politician, while Republicans went with a right wing populist. And still Democrats did not learn. Jon Ossoff was just the latest iteration of a Democratic Party unable to establish its own narrative for lack of imagination and vision. Rather than present a real policy alternative to Karen Handel, who had previously been endorsed by the Tea Party Express in 2014, Ossoff fashioned himself a moderate in the same vein as the centrist Republicans ousted in 2010. The millennial candidate was not only unable to compete with Handel in terms of fundraising, he was humiliated by similarly situated progressives with much smaller budgets. Whereas candidates like James Thompson of Kansas’ 4th District and Montana’s Rob Quist—both of whom received little financial assistance from the party apparatus, but stood up for policies like single-payer—significantly outperformed Hillary Clinton in their districts, the millennial Georgian did not. Meanwhile, Ossoff’s race cost roughly $30 million. Thompson lost by 6.8 points in a district Trump carried by 27.2. Quist, who could be considered a flawed candidate due to his personal history, lost by even less—6.1—when Trump won by 20.6. Ossoff, on the other hand, lost by 3.8 points in district Trump won by just 1.5 points in November according to The Upshot. Though he improved on those performances by roughly one point, Ossoff’s district showed more signs of swing to begin with. There is no world in which the millions spent justify the percentage gained. Making matters worse, following Ossoff’s defeat, establishment talking heads have been trying to pin the blame on factors outside of their candidate’s control—much as they did after Clinton lost to Trump. Democrats want people to be one way, but they're another. Dems need to stop trying to convert people into something they're not. Notorious Twitter troll and “comms strategist” Sally Albright even tried to pin it on Sanders. But these impulses are beyond misguided, feeble attempts to ignore the populist wave sweeping the world. At this point, they are downright destructive. Across the globe, anger from those left behind by globalism has flourished. It translated into a resurgence of Labour's power in the U.K., and the transformation of the National Front in France from a fringe party to a force to be reckoned with. Here in the U.S., it explains why Senator Bernie Sanders and President Trump, both of whom tapped into the populist wave, are now (respectively) the most popular politician in the country, and the President of the United States. Simply put, power must change hands within the Democratic Party or else there will be no alternative to Trump's right wing. There is no place for centrism (as it has been defined over the last few decades) in current politics.